The Australian Broadcasting Corporation (ABC) has released a new version of its flagship ABC app, which is available for the first time on Android tablets in addition to Android phone, iPhones and iPads. It follows the launch of an Android version of the ABC’s multi-media interactive magazine ‘The Brief’ earlier this month. A Windows version of ‘The Brief’ will be released in August. 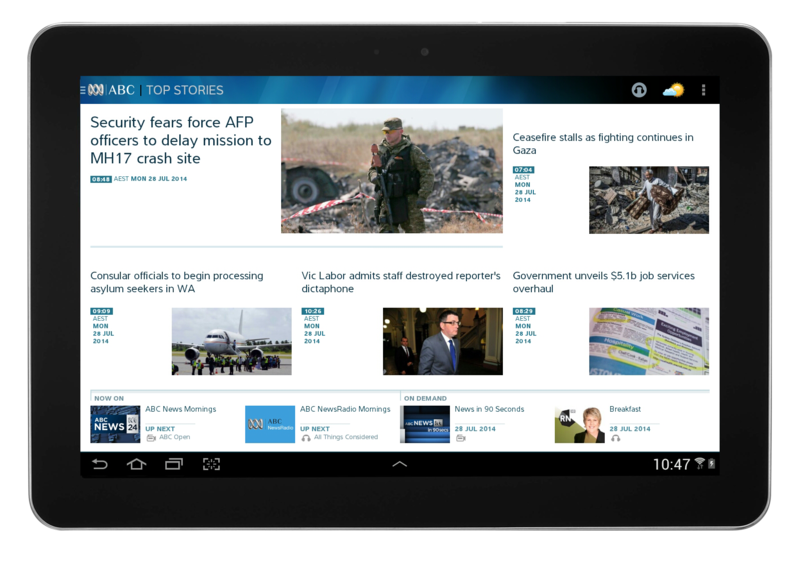 Version 3.2 of the ABC Flagship app includes improved readability of articles, smoother swiping between sections and streaming of TV and radio programmes on mobile networks as well as Wi-Fi – with the option of restricting use to Wi-Fi only if required. Version 3.2 of the ABC app for Android and iOS is available from today. For iPhone and iPad it supports iOS 7 design. The Brief brings audiences ‘Stories of the Week’ from the ABC, re-imagines ABC content from across radio, television and online into a rich multi-media experience developed specifically for tablets. The project aims to break new ground and explore Australians fascination with tablets for lean back immersive and personal experiences. The Brief is published weekly but readers can access up to three editions at a time. This week in The Brief we explore the shadow of flight MH17, the cost of childcare, the Commonwealth Games and why they still matter, together with food, reading, photography and entertainment.